When yoga runs hamok | YOGALEN. Dynamic yoga in Glasgow. I’ve always loved hammocks, mainly because when I’m in one it makes it easier to imagine I’m sailing across an ungirdled ocean, taking a quick nap between duties as a pirate with a shiny cutlass and a pocket full of wormy biscuits. A nice arcadian rhythm, if you will, between running amok and running hammock. Unfortunately, yoga rules out all the frenzied killing associated with running amok, so like a nice veggie substitute for more carniverous activity, we’re left with running hammock. Either way, I was pretty damn psyched when I heard about yoga + hammocks, which is variously called aerial yoga, flying yoga, or, most glamorous of all, Anti-Gravity Yoga (with caps for emphasis of how defied gravity will be in each weightless class). Attendees say they go flying, rather than swinging (ahem). Classes in London cost around £25, which is loads, so I never went. In Glasgow, though, there was an aerial yoga taster session for a tenner as part of Ashtanga Yoga Glasgow’s Karma Yoga Day. So off I went, laughing all the way to my hahahahammock. Ok I think that’s all the hammock jokes I’ve got. In any case, the hammocks are all soft silk and bright colours and make a good swoosh when we shook them out at the start of class. We hopped in, and swung through an aerial sun salute – flying planks, flying thighs, flying foot holds and only the odd unsupported warrior to keep us grounded. All very nice and swoopey. But it was only when we got to the inversions that I really started giggling. It was the best feeling ever – having my whole spine stretched out and swung about was epic. Like that first time you hooked your knees over a railing as a kid, then swooped down and looked at the world a different way. Then we did a somersault into savasana, and stretched out to the gentle creaks of the hammocks rocking. Very snooozey on a saturday afternoon…. Naturally, I came home and looked up how much it was to install a yoga hammock in the flat. Then I looked up courses in aerial silks. Then I looked at my bank balance, and then I went back to my plans for a pirate ship. 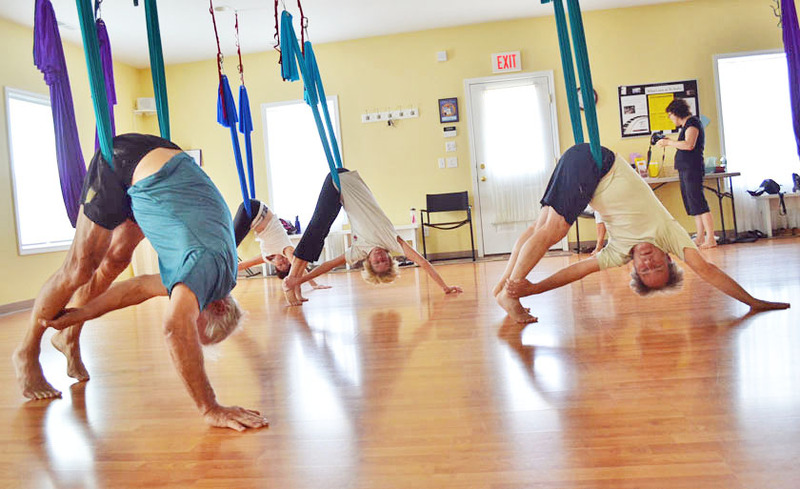 This entry was posted in Blogs and tagged aerial yoga, fun, Glasgow, hammocks, pirates, vinyasa flow, wellbeing, yoga. Bookmark the permalink.